Since then, in order to create a sense of agency and empowerment in their learners, Grass Valley has made the shift to maker-centered learning, placing it at the center of the school curriculum and culture. With the guidance of Paula Mitchell, who was hired as a Teacher on Special Assignment with Project Based Learning & Maker Education, the school prioritized hands-on experiences, with the goal of getting students excited and empowered about learning. The overall shift toward maker-centered learning was implemented by first creating a long term vision then adjusting resources and schedules along the way to support that vision. Cohorts of teachers were created to collaborate on maker projects and share strategies within their Professional Learning Communities. Teachers in both special and general education collaborate alongside each other to share approaches and ideas, ensuring that the special education curriculum mirrors that of the general student population. In November 2016, the school opened their maker space, called the “Wonder Workshop,” a classroom dedicated to maker-centered learning during the school day. This space has also served as a space for teacher collaboration, family making night events, and professional development workshops. The success of the maker-centered learning program at Grass Valley Elementary is due to collaborations across multiple individuals and organizations. Within the school, Professional Learning Communities, or PLCs, provide dedicated weekly meeting time for teachers to come together and share curriculum ideas and professional development tools. In addition to the PLCs, community partners such as Agency by Design have and continue to play a key role in providing professional development, support, supplies, and funding along the way. Not only did Grass Valley teachers Paula Mitchell and Diana Culmer participate in the 2016 – 2017 Agency by Design Oakland fellowship, they, along with two other colleagues, took the online Agency by Design course Thinking and Learning in the Maker-Centered Classroom, which was funded by a grant from the Light Awards. In addition, Grass Valley has partnered with Maker Ed to receive Maker Vistas, and has collaborated with numerous community makers. How can we as students take control of our food sources? How do we share our knowledge of health and wellness with others by producing, packaging, and marketing a product for a farmer’s market? In Expo One students demonstrated what they were learning through visualizations of healthy food, maps of local food sources, and planter boxes they had built for seedling vegetable plants. In Expo Two students became food scientists, which was visible in their re-constructions of the human digestion system, cookbooks with their own recipes, and a variety of food offerings they had made. In Expo Three, the culminating event of the year, students produced a farmer’s market, showcasing products they had made, packaged, and marketed themselves. Grass Valley teachers’ energy and dedication to pursue maker-centered learning continues to grow. This year there were seven Grass Valley applicants to the 2017 – 2018 Agency by Design Oakland fellowship! We are excited to announce that Monique Parish and Roxy Martinez will be joining us this year, and Paula Mitchell will be joining the Agency by Design Oakland coaching team as a Senior Fellow. Lastly, we celebrate and appreciate the leadership of the Grass Valley educators! Three years after Paula Mitchell attended the Project Zero Perspectives conference in SF, she and and Diana Culmer share what they’ve learned through a workshop of their own, “Authentic Inclusion and Hands-on Engagement,” at the May 2017 Project Zero Perspectives Conference in Pittsburgh, PA.
Grass Valley is a small elementary school in the Oakland Unified Public School District serving just under 300 students, mostly students of color, in kindergarten through fifth grade. Over 70% of the student population is socioeconomically disadvantaged, 25% is served by the special education program and approximately 17% of the students are classified as English language learners. Wonder Workshop will be attending its first Bay Area Maker Faire on Saturday, May 20, 2017, from 10:00 am – 7:00 pm. We will be a featured Maker copartnering with The Creativity Lab. Our booth will feature information and video about our makerspace and a small hands-on activity. Our student buttons will be on available for a donation. Join us for the April East Bay Maker Educator Meetups (EBMEM) at Grass Valley Elementary in Oakland for a night of culturally responsive making! We’ll begin by learning about Grass Valley Elementary’s recent event, Black History Month Family Making Night, an event that included students, parents, and teachers in a convergence of both traditional and new forms of making. Teacher on Special Assignment, Paula Mitchell, and Maker VISTA members Crystal Le and Maria Renteria will provide a presentation on this event devoted to honoring and exploring historic and modern contributions of African American innovators. After this presentation, we’ll dive into a hands-on making activity inspired by an African American innovator and explore culturally responsive making. Grass Valley Elementary is located at 4720 Dunkirk Ave in Oakland. There’s always plenty of street parking right out front. Please arrive ready to make! Grass Valley Elementary School in Oakland, CA seems almost sleepy in its Bay Area scenic setting. Nestled in the Oakland Hills, surrounded by redwoods and framed in quiet, smooth residential cul de sacs, your biggest impression when driving up to the school is the tranquility of the surrounding area. Upon further inspection, however, you’ll discover that the students and educators inside are all energetically, boldly participating and thriving in the school’s maker education program. Though it is one of many Title 1 public schools in the Oakland Unified School District, Grass Valley is considerably unique. The bulk of its student population isn’t drawn from those nearby hills and cul de sacs. Instead, almost all students must commute 5+ miles a day to attend school there. The district offers a special bus system to the students—which travels far further than most school buses each day—to ensure students have a ride, but mostly it’s dedicated parents, grandparents, aunts, and uncles who make the trek with students in tow everyday. The school also serves an above average amount of high-need students, with more than a third of the students enrolled in special education. Like many schools who decide to transition from traditional learning frameworks to fostering student-driven, hands-on learning with a STEAM focus, Grass Valley leadership tackled challenges and often slow-moving wheels as they moved to segue from adopting the idea and intention of making, to actual implementation and integration. In 2016, four teachers (two general education and two special education) and the school’s principal participated in piloting program components and regular in-depth discussions in order to determine what concretely needed to happen in order to make school-wide maker education successful for their students. Towards these research and piloting goals, one teacher, Ms. Paula Mitchell, stepped out of the classroom and into a new role as a Teacher on Special Assignment. To take on a transformation this layered, at a school as unique as Grass Valley, is an exceptionally large task—even for educators who (aptly!) 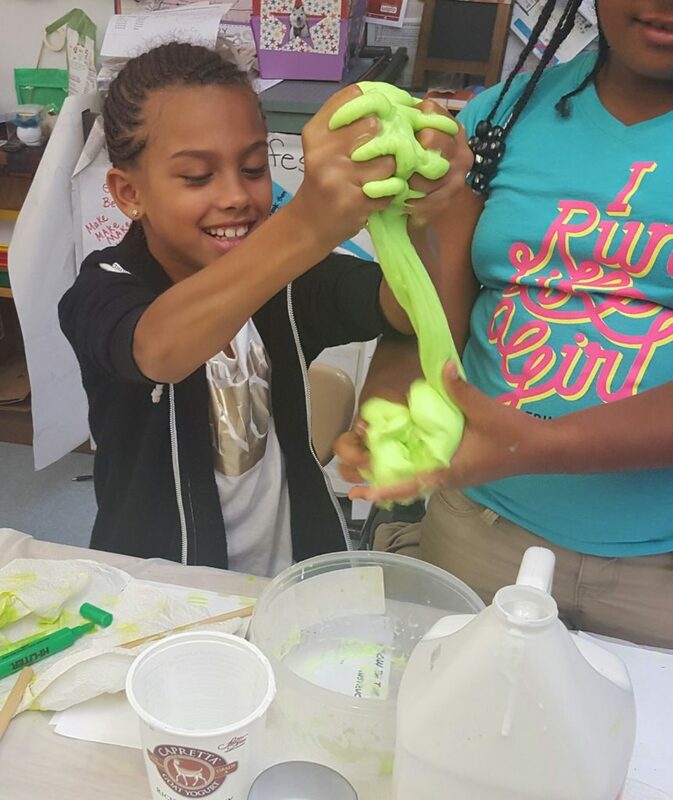 refer to their workplace as “The Little School That Could.” They quickly came to the realization that to shift to a STEAM-based curriculum that was both hands-on and project-based, they would need support from individuals and organizations. So, in the midst of launching their pilot program, they applied to partner with Maker Ed through the Maker VISTA program. While there is no doubt that Grass Valley was already in the middle of shifting the school’s culture, the arrival of two Maker VISTA members on campus—Crystal Le and Maria Renteria—allowed the staff to hit the turbo button on the transformation. Crystal and Maria arrived with strong, shared commitment to service, education reform, and learning-on-the-spot. They also brought previous experience with STEM-based projects, museum education and curation, and boundless energy and spirit. The work didn’t end with setting up the space. The Maker VISTA superstars, along with Paula, launched a full, grand opening event via a Family Maker Night, providing the opportunity for students to access and explore the makerspace for the first time alongside their families. Crystal and Maria worked with local businesses to secure in-kind materials and raffle prizes, and recruited STEAM-industry professionals to run demo stations during the event. They created flyers, planned the making activities, and trained the volunteers who would help run the different maker stations. These leaps and bounds didn’t slow Grass Valley or the Maker VISTA team down. In the following months, Paula, Crystal and Maria busily brainstormed project ideas, initiatives, and more maker nights. In a school-wide undertaking, students across grade levels built wooden garden boxes, learning about sustainability, nutrition, and ecosystems as they constructed with lumber and guidance sourced from a local woodworkers union by Crystal and Maria. This winter, the team organized a Black History Month Family Night and Heritage Potluck, in an evening of connecting community and culture to making. They planned numerous activities, and commissioned a panel to share diverse STEAM career paths, stories, struggles and successes with students and families. The event also spotlighted the school’s first ever Maker Ambassadors, students from three grade levels who dedicated themselves to a month of project work based on the inventions of historical African American Innovators. Whether redefining spaces, planning events, creating partnerships in the community, or connecting heritage to making, the Maker VISTA members at Grass Valley have made impressive and significant impact within just one year. While the school’s ambitious making journey certainly didn’t start with the Maker VISTA program, the partnership has accelerated progress, boosted capacity, and increased valuation for making in this unique, driven, determined Little School That Could.